The Hague’s loonies operating under the name Shitcluster have staged another freakshow of rhythmic noise, to disrupt ‘dance music’ as such. New distorted deviations by Charlie Watkins and Jan Duivenvoorden – the latter running nowadays the Unit Moebius Anonymous – begin with two ramming tracks on the A-side that remind of Ancient Methods’ “The Whip” from 2009. The gruelling chug of A1 is led by hollow, bouncy drums and subtle complaints like coming from Sid Vicious’s taped mouth, followed by asphyxial feel of A2. 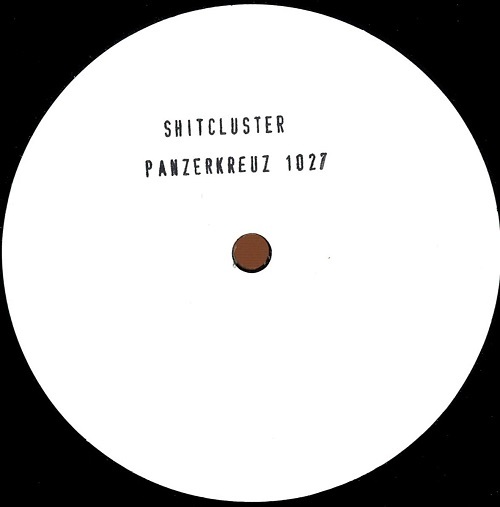 Ever since their first release on Bunker, Shitcluster has been a favourite orchestra of mine and in their Panzerkreuz debut, they target non-conservative dancefloor with their darkest sound so far, without any tongue-in-cheek feel of pioneer times.